Coca-Cola is a most popular brand around the globe, and it is sold in every corner of the Earth. However, researchers are concerned about the acidity of this drink and suspect its toxicity which can seriously endanger our health on the long-term. The pH of Coca- Cola is only a number higher than the one of the battery acid. This drink is practically destroying metabolism since its acidity level matches the acidity levels of the battery acid. This poison is linked to diseases like cardiac arrest, stroke, asthma, chronic obstructive pulmonary disease, etc. and is especially bad for young children since it interferes with the balanced diet. People who consume it have been found to inculcate dependence on caffeine and deficiency of important minerals like calcium, magnesium, and vitamin A. Moreover, Medical News Today writes about the serious negative consequences of the excessive consumption of such a sugary drink, saying that there are about 10 teaspoons of added sugar in a single can of cola, which is much above the guidelines given by the World Health Organization (WHO) of no more than 6 teaspoons of added sugar daily. This explains why sugary drink consumption is linked to an array of health conditions. The Harvard School of Public Health reported that people who drink 1-2 cans of sugary beverages daily have a 26% increased risk of developing type 2 diabetes. Additionally, Medical News Today reported on a study claiming 184,000 global deaths annually are due to sugary drink consumption. A study sponsored by The National Heart, Lung and Blood Institute showed that the consumption of at least one soda daily raises the risk of metabolic syndrome by 44%. Participants in one other study which drank soda on a daily basis were found to have a raised risk of stroke or a heart attack by 48%. Therefore, the acidity of this drink makes is unsuitable for human consumption, but an excellent cleaning agent in the household. 1. Remove rust – Dip a sponge or a cloth in it, and use it to clean the rust from your metal objects in the house. 2. Remove strip paint from metal furniture -- Soak a towel or a sponge in Coke and use it to wipe the surfaces with paint. 3. Restore the shine of chrome objects -- Use Coke and aluminum foil to make the chrome objects shiny again. 4. Clean your engine – Coke will help you make your engine shiny like new. 5. Clean burnt pans – Pour some Coke in the pan and leave it for several minutes before you rinse it. 6. Clean your toilet -- Pour Coke around the entire toilet bowl, and flush after a few minutes. 7. Clean the vitreous china -- Coke will clean the stains of the china like no other cleaning product. 8. Make Pennies Shiny – Soak the old pennies in Coke to restore their shine and remove the tarnish. 9. Clean the oil stains from your garage floor – Clean the garage floor with some Coke and leave it for a while before you hose it off. 10. Blood stains -- Use Coke to clean the blood stains from clothes or fabrics. 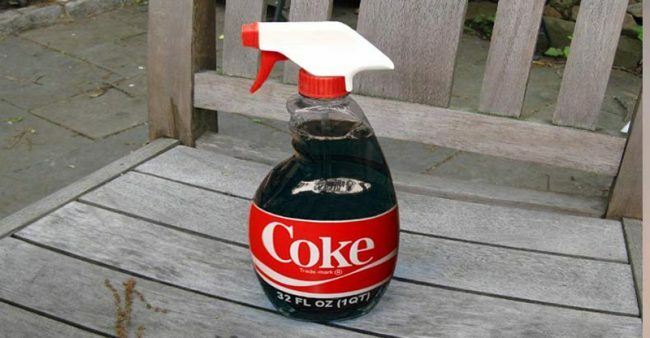 So, it seems that we should not drink it, but we can definitely buy Coke and use it as a multipurpose cleaner at home!